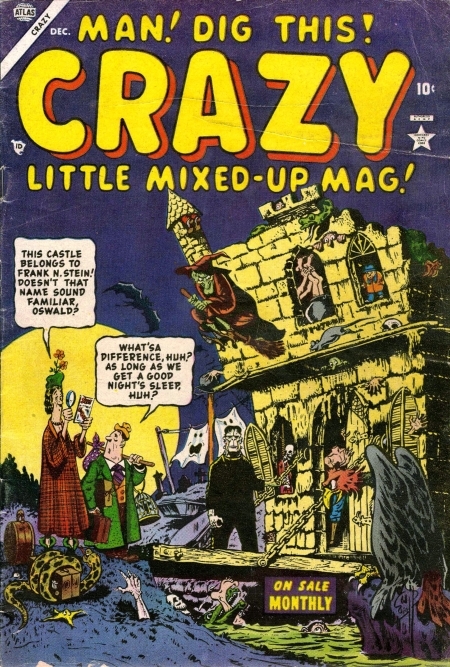 Notes: Kurtzman's version of this classic, also titled "Frank N. Stein," appeared in MAD 8, dated December 1953-January 1954. Atlas generally had a longer lead time, so CRAZY 1 probably hit the stands first. In spite of an opening and closing that parodied the then-wildly-popular TV show "Dragnet," this version sticks about as close to the original as Kurtzman did, even having the monster be friendly to a little girl. - John Benson. Notes: Signed second panel last page.